We operate a well-equipped workshop where we manufacture new wheelchairs and repair or modify existing ones. This operation employs six to ten technicians, mostly disabled, and builds rugged chairs well suited for the tough terrain of Guatemala. We employ modern TIG welding and other fabrication equipment and maintain computerized records on each client so we can respond quickly to needed changes or repairs. Funding for much of our equipment, tool and materials has come from a Rotary International Foundation Grant, coordinated by the Portland, Oregon Rotary Club, and from other donors. In 1997 our founding members attended an intensive course on Wheelchair Design and Manufacturing at San Francisco State University, a Whirlwind Wheelchairs International training program. These founding members continue to pass along skills to other wheelchair users by holding workshops in Antigua, Guatemala. We have now trained over 30 disabled and non-disabled workers. During 2008 our workshop has provided over 100 new and refurbished wheelchairs. 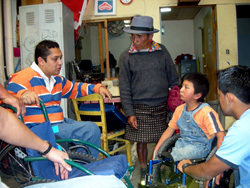 One of the many ways you can help Transitions is to sponsor a disabled client to obtain a new or refurbished wheelchair. 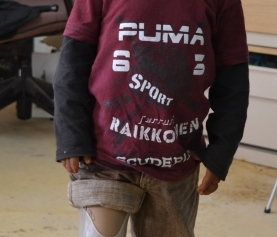 A designated gift of $450 will provide a new wheelchair and a gift of $150 will refurbish an existing wheelchair. When we acknowledge your gift we will also inform you of whose life your gift has enhanced.